It’s a scene Patrick Marleau never tires of: four young players, a few errand high sticks, a couple of disputes and one good time had by all. There’s no two points or Stanley Cup on the line, stoppages are a rarity and any minor infractions are overlooked with a smile. Mini stick hockey at the Marleau house is a nearly daily occurrence. 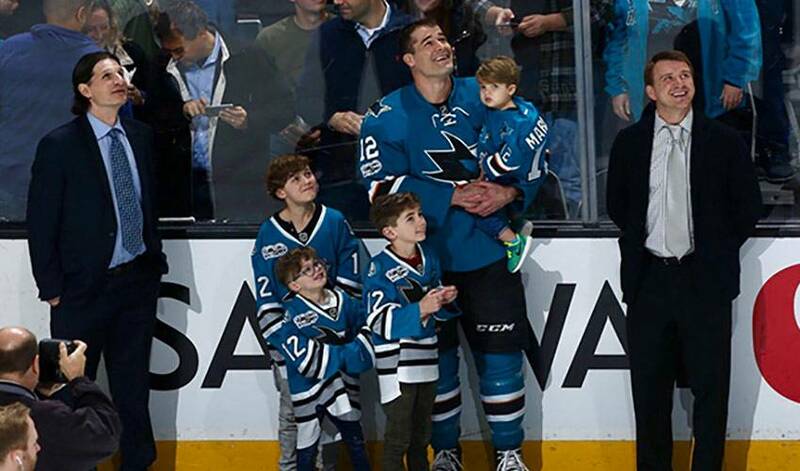 For the father of the four boys – Landon, Brody, Jagger and Caleb – who happens to be a decorated NHL veteran, having a front-row seat for it all is about as good as it gets. Marleau sees his big-league career in the same terms. Earlier this year, the Saskatchewan native was feted at a Sharks home game for his 500th career NHL goal. His wife Christina and their kids were there for the presentation. The team’s all-time leader in a slew of offensive categories, Marleau has also reached some other impressive milestones along the way, namely, 1,400 games played and 1,000 points. It’s all been achieved in San Jose colours. There has been one constant over an NHL life that began in 1997-98. He laughs at how it’s all seemed to go by so quickly. Perhaps, one day, there will be another Marleau skating on NHL ice. For now, though, Landon, Brody, Jagger and Caleb will sharpen their skills through mini stick hockey. A little something they picked up from an ideal role model. Patrick Marleau’s penchant for being the perfect role model came long before he ever skated on NHL ice. Russ Farwell knows all about that. Like everyone else on the Toronto Maple Leafs roster, Jake Gardiner was familiar with Patrick Marleau’s impressive hockey credentials long before he signed as a three-year contract with the team on July 2.